Do you know How to make clarified butter? Do you know what is 'clarified butter'? Clarified butter is referred to as ghee in Indian cooking. Ghee has got many medicinal uses too. 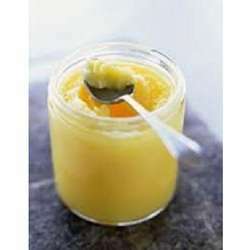 Ghee is a very commonly used fat in Indian recipes. It is used for deep frying, shallow frying, as a seasoning. It is used in the making of many Ayurvedic medicine preparations. Ghee is also added to rice or breads or curries just before serving. It can be served with snacks such as Sheera, Dosa, Idli, Rice Roti, Paratha etc. It adds an inviting aroma as well as taste to the dish. Ghee is not just a fat for cooking. It is used for medicinal purposes too. Ayurveda (ancient Indian medicine) uses ghee as a base for many medicines. What is ghee made with? Ghee is generally made with buffalo milk or with cow's milk. The ghee made from buffalo milk is white in color while the ghee made form cow's milk is yellowish in color. The ghee made with cow's milk is healthier than the ghee made from a buffalo's milk. Ayurveda recommends using butter and ghee made with cow's milk. Ayurvedic medicines are made with cow milk. Making ghee at home is simple. Many Indian housewives collect cream from the milk they use everyday. This homemade cream is used to make butter and this butter is is used make homemade ghee. Homemade ghee has a better aroma and taste as it is very fresh. Ghee can also be made with the store bought plain butter. Using unsalted and non flavored butter is better. You only need plain unsalted butter and a deep pan. It is a process where you remove the moisture, the water content by heating the butter and get the pure fat. As the moisture content is removed, ghee lasts longer than butter. You can keep and use ghee for months. It will keep for a year or more in the fridge.